For many centuries Poland and Russia formed the heartland of the Jewish world: right up to the Second World War the area was home to over 40 per cent of the world's Jews. Nearly three and a half million Jews lived in Poland alone, with nearly three million more in the Soviet Union. Yet although the majority of the Jews of Europe and the United States, and a large proportion of the Jews of Israel, originate from these lands, and many of the major movements that have characterized the Jewish world in recent times have their origins there, the history of their Jewish communities is not well known. Rather, it is the subject of mythologizing that fails both to bring out the specific features of the Jewish civilization that emerged there and to illustrate what was lost in its destruction: Jewish life in these parts, though often poor materially, was marked by a high degree of spiritual and ideological intensity and creativity. Antony Polonsky re-creates this lost world - brutally cut down by the Holocaust and seriously damaged by the Soviet attempt to destroy Jewish culture - in a study that avoids both sentimentalism and the simplification of the east European Jewish experience into a story of persecution and martyrdom. 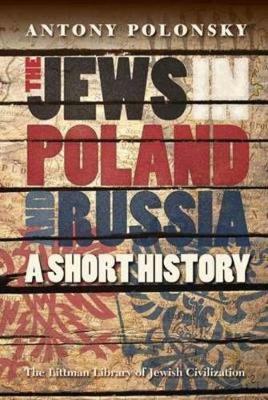 It is an important story whose relevance reaches far beyond the Jewish world or the bounds of east-central Europe, and Professor Polonsky succeeds in providing a comprehensive overview that highlights the realities of Jewish life while also setting them in the context of the political, economic, and social realities of the time. He describes not only the towns and shtetls where the Jews lived, the institutions they developed, and their participation in the economy, but also their vibrant religious and intellectual life, including the emergence of hasidism and the growth of opposition to it from within the Jewish world. By the late eighteenth century other factors had come into play: with the onset of modernization there were government attempts to integrate and transform the Jews, and the stirrings of Enlightenment led to the growth of the Haskalah movement that was to revolutionize the Jewish world. Polonsky looks at developments in each area in turn: the problems of emancipation, acculturation, and assimilation in Prussian and Austrian Poland; the politics of integration in the Kingdom of Poland; and the failure of forced integration in the tsarist empire. He then shows how the deterioration in the position of the Jews between 1881 and 1914 encouraged a range of new movements - Zionism, socialism, and autonomism - as well as the emergence of modern Hebrew and Yiddish literature. He also examines Jewish urbanization and the rise of Jewish mass culture. The final part of the volume deals with the twentieth century. Starting from the First World War and the establishment of the Soviet Union, it looks in turn at Poland, Lithuania, and the Soviet Union up to the Second World War. It then reviews Polish - Jewish relations during the war and examines the Soviet record in relation to the Holocaust. The final chapters deal with the Jews in the Soviet Union and in Poland since 1945, concluding with an epilogue on the Jews in Poland, Lithuania, Belarus, Ukraine, and Russia since the collapse of communism. This is an abridged version of a three-volume hardback edition which won the 2011 Kulczycki Book Prize for Polish Studies (awarded by the American Association for Slavic, East European, and Eurasian Studies) and also the Pro Historia Polonorum Prize for the best book on the history of Poland published in a foreign language between 2007 and 2011 (a prize established by the Polish Senate and awarded by the Polish Historical Association).